Now here is a Very Special Property. 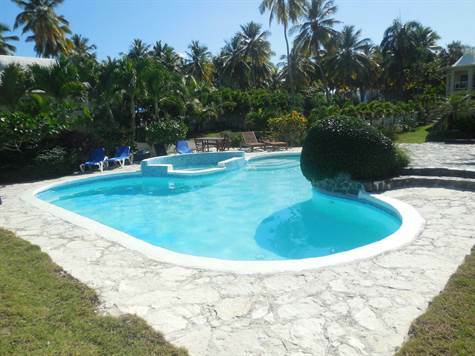 A large, almost new 4 br beachfront villa that has a separate two story apartment (also with ocean view) that is large and very attractive. Either of these two dwellings would be a nice place to live for the person that likes their peace and quiet. The house is solid, beautifully decorated and livable with its modern open design and views everywhere' the apartment is spacious with large bedrooms and sits over a mammoth 2 car garage. And lovely grounds everywhere you look. Really, this place has so much room you could live in one and rent the other, or maybe have the family down for the winter. Worth a close look, this property has real value at this price.